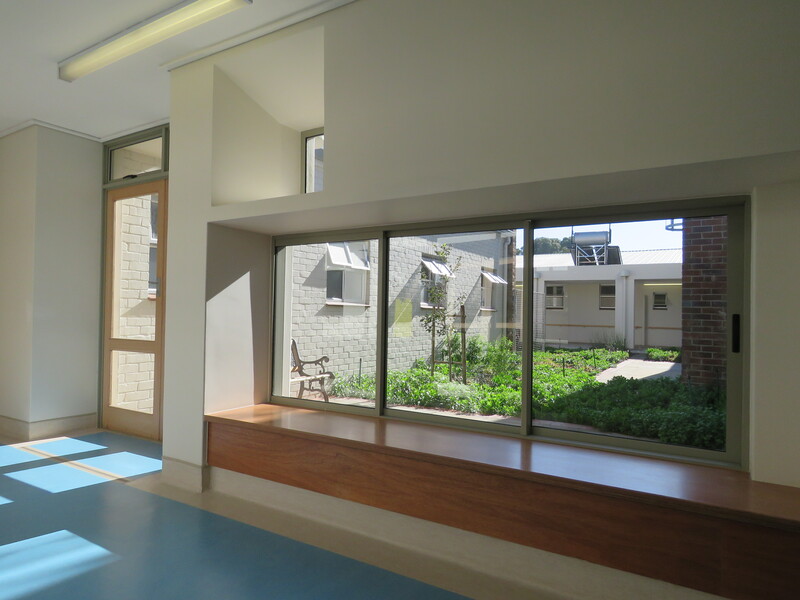 Considerable care and effort has gone into transforming wards, consultation spaces and courtyards of the existing facility, built in the 1950s by the Pallotine Sisters to provide care to children. Today it offers step down care to 150 children from vulnerable communities. Wards have been enlivened by adaptations of the roof structure to bring in more natural light, improve ventilation and allow views of the sky. Openings have been controlled to suit the scale of children and subtle colour palettes have been introduced to identify different zones and functions. The enhancement of the flow between the wards and the exterior play courts adjacent to wards and rehabilitation areas have also been a strong focus. The courtyards each have their own distinct character, feature natural indigenous fynbos and in some instances a successful interplay between natural and artificial grass elements. Careful attention has been paid to the detailing of architectural elements, such as eaves and pergolas and demonstrate a clear sense of delight in the re-making of these buildings. The impact of these interventions is aptly summed up by the Director of the facility, Thea Pattersen, as follows: “It is a light filled, warm, containing cheerful environment – all elements essential for the healing of children”. The original facility was designed within the overall spatial paradigm of separation, with the purpose of keeping different racial groups separated as required by apartheid legislation at the time. When the new interventions are measured against the overall layout of the original facility as a whole, with its rigid institutional framework and challenges in terms of wayfinding and legibility, it is clear that the ability of the best architectural endeavours to make a significant impact on the overall experience of the facility, require both a more extensive brief and budget, to achieve realisation.